Millpond Plants | Supplier of water plants and upland garden plans for Missouri and surrounding states. Supplier of water plants and upland garden plans for Missouri and surrounding states. 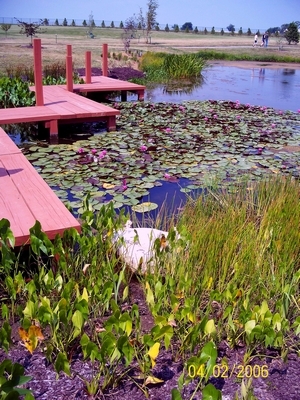 WHAT WE DO: Millpond Plants supplies Missouri and contiguous states with plants appropriate for water gardens, frog ponds, lakes, mud flats, and slow-moving stream stabilization and beautification. We also provide consultation for planning, and successful techniques for installation. PLANT SOURCES: All vegetation available through this contact is Missouri source or has grown here in wild conditions for enough generations to be adapted to this climate. This is especially important for the success of your planting. Plants imported from a distant region will not be adapted to the extremes of climate and soil naturally found in Missouri. Water plants from Millpond Plants are all wild-grown and will be hardier than nursery-grown plants. 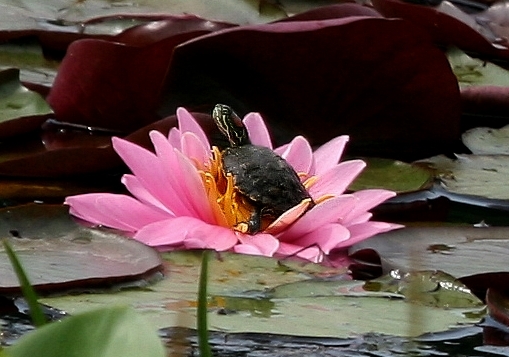 All water plant recommendations are based on Water Plants for Missouri Ponds by Whitley, Bassett, Dillard and Haefner; available through the Missouri Department of Conservation Nature Shop www.mdc.gov . Besides the suggested book, more information on individual species can be found on the NRCS Plant Database – then type the plant’s scientific name in the search box. PLANNING SERVICES: Native water garden, or woodland, or prairie garden planning is available for clients in counties contiguous to Boone County MO. Let’s talk about all the aspects of your pond or garden to head off any unrealized problems before they cause frustrated efforts and waste of resources. All information is personalized to the site issues and the client’s vision; no cookie-cutter plans are used. On-site consultation: $100 minimum for one small garden or frog pond space; $15/hour over 6 hours. This includes suggestions for site preparation, species list for site, reference sketch. Average suburban lot makeover can be $150 to $200; farm ponds and field renovations can be about $300 to $400 depending on the size, number of site trips, and the details the owner wants. For sites more than 20 miles from Ashland, add drive time at $15/hour. Plant shopping and delivery: $25 and fifty cents per mile. Fencing, mulch, rock and other supplies will be additional according to the decisions for site management. It is important for the landowner to install the plants so s/he knows what the plants are, and where they were planted so maintenance can be continued. In rare cases, installation can be provided for $25 per hour for labor. Brief consultation is available by phone or by email about your site size and management practices prior to an on-site consultation. Very difficult to give correct information without seeing the site. Email address is: beckyerick711 at centurylink dot net. It is highly recommended to schedule an on-site consultation in March, April or May for pondscaping plans. Uplandscaping can be discussed any time. Decisions of plants appropriate for the size and use of the body of water can be done after the consultation. Include your phone number in your email if you want a call back. INSTALLATION: Water plants will be available for delivery and your installation from 1 July to 15 September with few exceptions. Upland plants are available from late April through early October. You will get all the instructions you need for installation of a successful planting. Prices and availability of each species listed in the Water Plants page must be requested only by email beckyerick711 at centurylink dot net . Include your phone number in your email if you want a call back. Prices range from $.50 to $12 depending on quality of species. The plants listed here in the Water Plants page are usually available. If you know of other species you think you want to use on your property, we can discuss appropriate use and availability.